The similarities of these two great African women cannot be summarized in a single sentence because there is a lot in them that define them as true African woman and African in them both. These two women represent a modern African thinking that elevate us all and begin to define and pride ourselves as black women. Sure subjective as it may sound, it is this true black colour undiluted with the culture of bleaching: that was my first impression in Manuela Fischer. Yes this black colour is indeed my shining armour; said Hugh Masekela. Why should the cosmetic industry distort this from our black women and black girl-children and make us think to be light-skinned is better and superior? Why is bleaching - the cosmetic industry selling us a dummy to think to be near whiteness is modern and civilized, dominating our African societies with products that impugn our identity to the point of madness? I met Manuela Fischer at our casting call of theatre auditions in Theatre Bremen. She automatically stole the eyes of all of us the theatre Hall. Her majestic movement when she entered the hall informed us at once; she is not an ordinary persona, just like our Jessie Majome in Zimbabwe. She introduces herself to the group to display her credibility, what we have already perceived and digested in her gesture and facial appearance. Ela, we call her, is as a matter of fact a naturalized German, came to Europe when she was barely one year old. As fate would have it, when she was born her mother died giving birth to her and was sent to an orphanage in Dakar Senegal, her homeland. The adoptive white parents adopted her from the Catholic Mission for Orphans. Money in exchange for adoption could have been done. In retrospect, she is by no means a bitter woman because she was brought up in a foreign culture by white parents. It is this African aspect of her and in her that will overwhelm anyone who thought adoption had negative consequences in a growing up child who is wholly black surrogated by parents who are wholly white in an environment that has a homogeneous cultural society such as Germany. Ela is a talented woman: she is a singer, a poet, a dancer and a story teller. She is eloquently gifted and talented and she shines out as such. Then she showcased her dances, her poet, she sang and danced the pieces of songs she composed on her own. The combination of her energy and talent combined began to flow electrically, a multidimensional style of performance. If Marechera had lived, he was going to be impressed too because he was a hard to please artist. It was a breathtaking moment to all of us in the theatre hall. We found ourselves breathing in deeply what she could contribute that day: none of us was a match to what she can do. Her performances were unparalleled, exceptionally good and very authentic. I just managed to dash to her side and asked if we could meet again separate from the group, I wanted to know more about her. I visited her house in Bremen-Mitte, which is right in the middle of left-oriented Bremen residents, Die Viettel. Manuela is a mother of five beautiful children. At the first eye contact, the children are kind and respectful to strangers. At the same breath, they have this African upbringing in them that I noticed at once: where did it come from, their mother was barely in Africa ever since she left Africa as a baby. The kids speak French and German fluently and still connected to their mother in the African mother-child style. Sitting, talking and playing with them, I realized that they could be my grand-children as a matter of fact, they played with me giving me those signs, we have a grandma here, a carved position I loved and enjoyed most that moment. Manuela Fischer is a wise woman. Her age is 35 years, I learnt a lot from her at that evening discussion we had. She has read a lot, seeing the tomes of philosophical books present in her home. At the corner of the sitting room is a piano. At those times she feels like composing a song she sits on her piano and starts composing her songs: she says. She is motherly and can mother anyone, suddenly she came to me and pressed her both hands on my cheeks and kissed me. I, on the other hand, managed to suppress tears on my watery eyes; I was emotionally moved and felt loved by this young woman I admire so much. In me, I realized a girl who was capable of being mothered by a woman who could be my daughter by virtue of our ages: I am 30 years her senior. To love your neighbour is indeed a gift of life, not all of us are capable of it. The load of work she has at home of looking after her children from to two to thirteen years while the husband is at work is still a mystery to me. She will still find time for herself to compose her poetry and songs. She is actively engaged in a political organisation, Die Linke and at the same time she is on our theatre group auditions for the next theatre performance in May. I can only admire her rare energy, talent and intellect. During my university years, I personally managed to look after one child, but was always out of my breath and without much energy joggling just two balls: child care and University work. I could not even think of a second child under those circumstances. Manuela Fischer is down to earth just like our Jessie Majome. She is a no nonsense woman just like our Jessie Majome. Both these two women are an embodiment and an expression of an African woman and African. 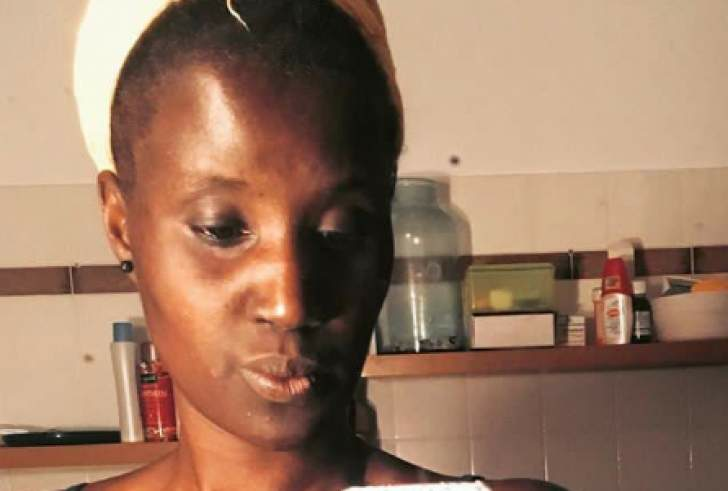 In all her 35 years in Europe she has never for once tried to bleach her face and body because she wants to be different and can assimilate with a lighter colour skin and be that accepted colour that is definitely not black because an African woman is black. Both these women Jessie Majome and Manuela Fischer are proud of their African trade mark: the black colour. Our late icon Hugh Masekela will smile in his grave when we remember just the two ambassadors of African identity, these torch bearers; Jessie Majome and Manuela Fischer; they indeed represent Africa in every respect and with great dignity we African women deserve.